Back of card: Based on major arcana 17, the Star, shown above. Printed in dark blue on white, with a white border. May be inverted. Booklet included: Yes, 64 pages, 2.6 x 4.74 inches, or 66 x 120 mm. Stapled on the short side. Instructions in English, Italian, Spanish, French & German. 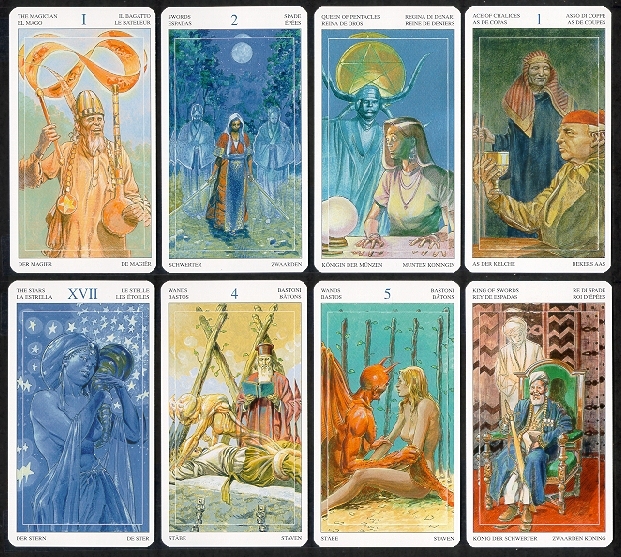 The Tarot deck designed by Roberto de Angelis for exploring the boundary between the world of reason and that of emotions, that Middle-earth where shadows come to life and our unconscious universe takes shape, even if fleeting & often illusory. The "spirits" are divided into five categories: the gods and higher demons, which correspond to the Major Arcana; the lower demons (or lemures) which symbolize fears, obsessions, passions and faults and correspond to the symbol of fire of the wands; the kind-hearted spirits which appear as benevolent apparitions and influences, corresponding to the symbol of water of the chalices; the angels, custodians & judges of human actions, which correspond to the symbol of air, and finally the spirits of ancestors and forefathers, which correspond to the symbol earth of the pentacles. All the cards are formatted as a picture imposed on an underlying picture (note thin white line borders, above). Lo Scarabeo does the very best nudes.